Ever the storytelling chameleon, Ted Dekker zigs yet again, deviating from the layered, expansive fare of his past few years to a simpler, more straight-ahead narrative. Eyes Wide Open is a taut, psychological effort with allegorical overtones, aimed at the young adult marketplace, that hearkens to the riveting between-the-ears type of thriller with which Dekker first made his mark years ago. It’s gripping and refreshingly simple, with only two real characters, along with a few other antagonists, that takes no side trips on its high speed race to the finish. The book was released independently in digital-only format by Dekker in late 2013 in four episodic installments, and sold so well, Nashville-based Worthy Publishing snapped up trade paperback rights. A follow-up is due in the spring. Eyes Wide Open takes a journey with Christy Snow and Austin Hartt inside a nightmare scenario straight out of a Stephen King novel. Both college-age main characters are orphans who find themselves the victims of bizarre psychological experimentation on a day which starts like any other when Christy journeys inside Saint Matthew’s Hospital to retrieve a locket she left in a storage room while hanging out with Austin. After she plummets through a trap door in the floor, she finds herself stuck in a hidden sub-basement room where the only way out is through a narrow crawl space. She frantically calls Austin, then wedges her way through the tunnel, and winds up inside the psychiatric wing of the hospital, where she is soon apprehended and taken in for questioning by admissions director, Douglas Fisher. While at first, Christy believes she is being mistaken for a patient named Alice Ringwald, through a strange sequence of events, she soon is admitted to the psychiatric wing as a patient diagnosed with severe delusions. When Austin arrives at the hospital nearly an hour later, he falls victim to the same scenario, and is told his real name is Scott Connelly. While Dekker never directly states that Fisher is up to no good, it seems very clear that something diabolical is going on behind the scenes. The psychiatric wing is a labyrinth, and its treatment methods are rather suspect. But that setup is only the beginning for the jarring middle section of the novel. Once Austin and Christy are imprisoned inside the psychiatric wing, they both begin a slow descent into the tortured world of their own inner demons. At the leading of Dr. Kern Lawson, both patients journey back into their past, and both arrive at the same jarring realization: they are beginning to lose track of which life – the one they used to have, or the one suggested by Dr. Lawson – is the true one. But as the novel ramps up for what seems to be the inevitable showdown between Christy and Austin, and Dr. Fisher’s minions, the plot takes an unexpected left turn into spiritual territory, introducing a character named Outlaw who challenges yet again the pair’s grasp on reality. As it reaches its climax, Eyes Wide Open aims to prod readers to examine their own self-perception and strip away all outside influences to gain an authentic sense of identity. In this way, Dekker’s dark tale is commendably ambitious. 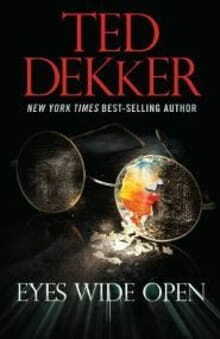 While the whole story seems stretched a bit thin for a novel-length work, it does indeed hit its mark, and those young readers who have enjoyed dark, psychological fare in recent years should dive deeply into Dekker’s new world.